I made this for the first time, back on Thanksgiving Day . 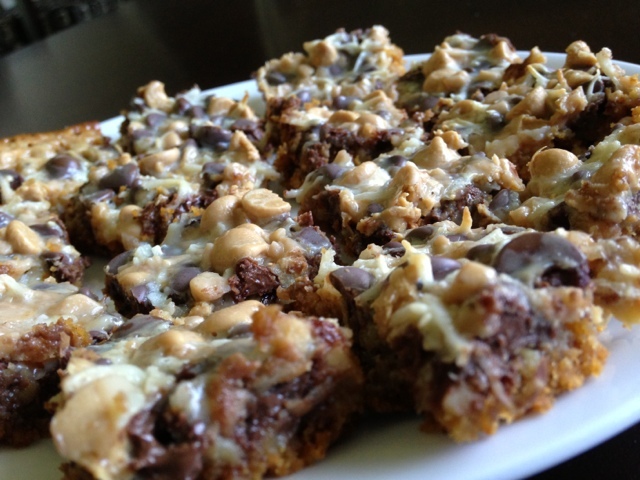 I’ve made them several time since, and they are one of my favorite dessert bars for sure. They are easy to make, absolutely delicious, and for sure satisfy your sweet tooth! The above quantities can be varied depending on what flavors you like. I measured it out the first time I made the Seven Layer Bars, but now normally just sprinkle the different ingredients on top to my liking. I took the graham crackers and put them in a large ziploc bag and crushed them (you can also just get the crushed graham crackers, i just happened to have these at home and i made up this recipe as I went along). Once it is all crushed, mix the graham crackers with the melted butter well (I did it with my hands because it was the easiest way to mix it and keep it from clumping). I used a 9 by 13 dish to make this in (spray with non-stick spray). So in it, I put in the graham cracker mixture and pressed it in well covering the whole bottom of the dish in a thin even layer. I chopped up a cup of walnuts and sprinkled it evenly over the graham crackers. On top of the walnuts, I sprinkled 1 cup of milk chocolate chips. On top of the milk chocolate chips, I sprinkled 1/2 cup of peanut butter chips (the reese’s one). On top of the peanut butter chips, I sprinkled 1/3 cup of heath bar toffee bits. On top of the heath bar bits, I sprinkled 1/3 cup of coconut flakes. And finally, on top of the flakes I poured one can of condensed milk all over it, making sure the whole dish was covered evenly. I baked it for about 20 minutes — just watch the oven after 15 minutes. All you want is for the top to be the light golden brown color. Once you take it out of the oven, let it cool completely before cutting them into squares and serving. Other possible layers you could try/substitute: white chocolate chips [or semi-sweet or dark chocolate chips], other nuts [such as peanuts, pecans, or almonds]. Update [5/17/14]: If you like this Seven Layer Bar recipe, check out another version by clicking here! Or my Chocolate Chip Squares! 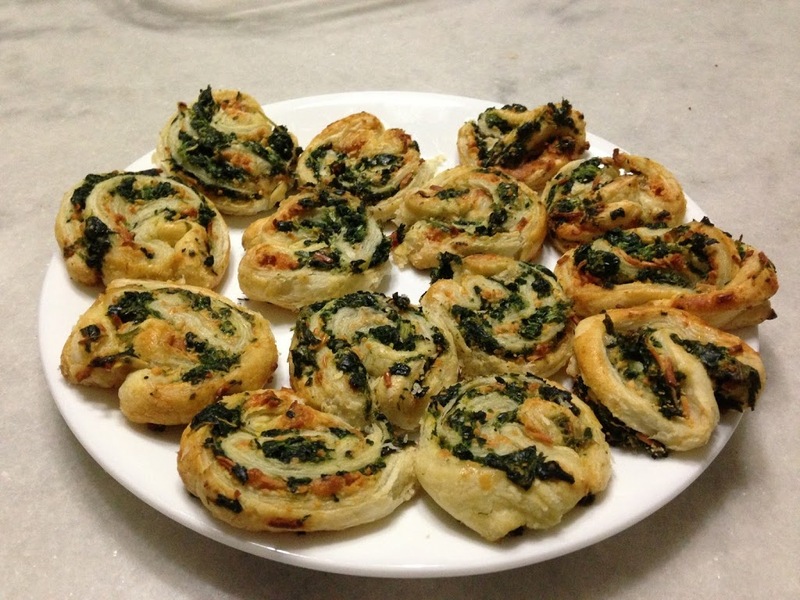 These Spinach and Cheese Swirls are a great and quick, appetizer or snack! Leave out your pastry sheet at room temperature to let it soften. Preheat your oven to 400 degrees. Meanwhile, mix together your egg and water and set it aside. 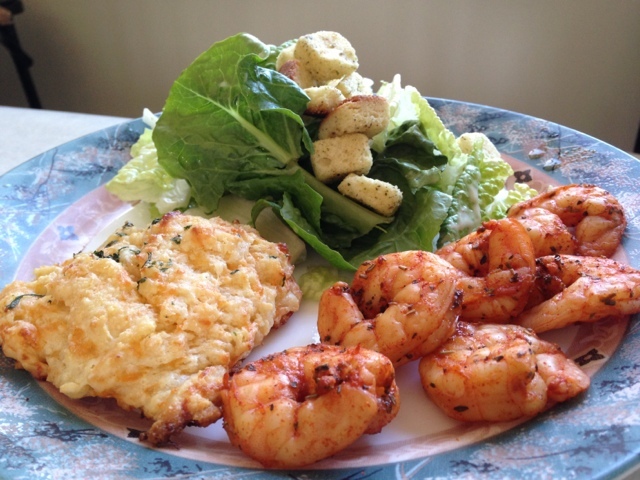 Mix together your Monterey Jack cheese, Parmesan cheese, and garlic powder. Brush your [softened] Puff Pastry sheet with the egg mixture. Next, sprinkle your cheese mixture on top. Finally, add your spinach on top. Put it in the freezer for a few minutes, and then roll it up like a jelly roll. Tip: Putting it in the freezer makes it easier for you to cut them. Cut into even, thin [but not too thin] slices. Place on baking sheet. Brush the tops with egg mixture once more [to help get the golden color on top]. Bake for about 15 minutes or until they are golden brown. They can be served warm or at room temperature [I find them to taste best while they are warm, right out of the oven]. This is probably one of my favorite things to make. 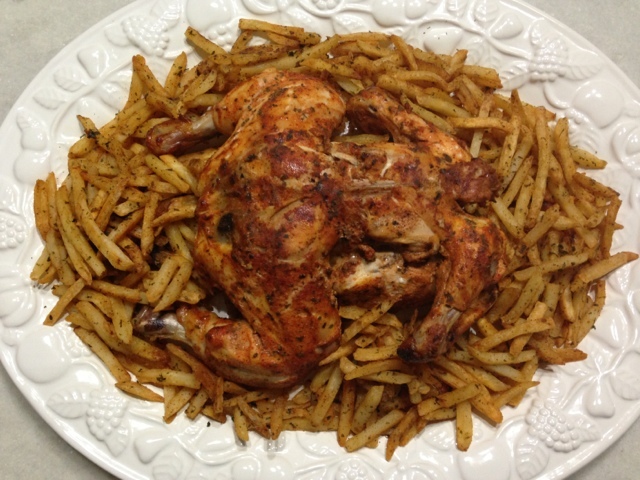 It’s also what I intended to make on the day I posted about my Roasted Chicken instead [which was equally delicious]. I slow cook it in a pot over extremely low heat over a period of three to four hours… and it’s scrumptious. 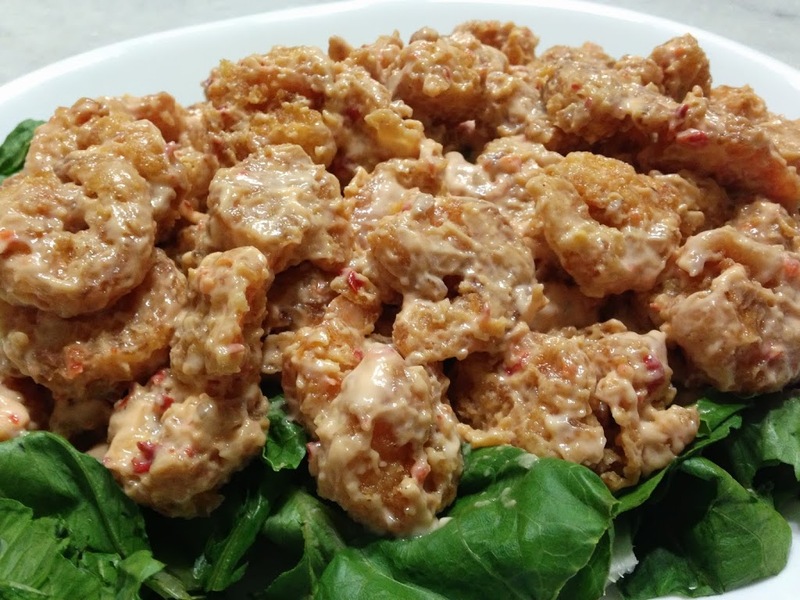 So tender, that it almost falls apart off of the bone and melts in your mouth. Full of flavor inside and out. Love it! Note: I slow cook it [on the stove], not cook it in a slow cooker [although I did take my slow cooker out recently to start using finally]. The white meat lover in me [as in I won’t eat dark meat] goes straight for the breast meat. I take a whole chicken and with a fork poke holes all over it (so the marinade seeps inside). 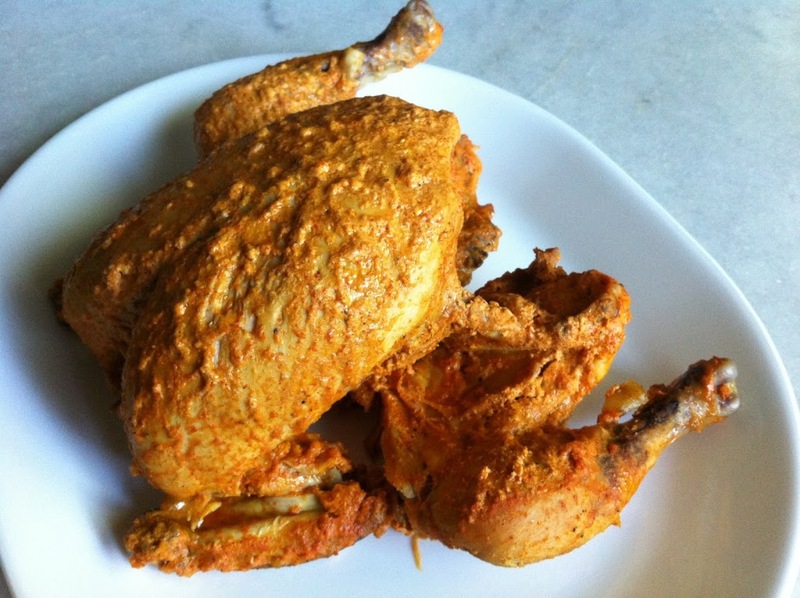 I, then, marinate the chicken with: salt, pepper, paprika, garlic powder, ginger powder, cayenne pepper, chili pepper, lemon juice, yogurt, and Shaan Tandoori Masala. I make sure that the marinade covers everything, and inside the cavity area as well. If time allows, I like to let the marinade set in for a while (a couple of hours or over night). When I am ready to cook it: I transfer the marinated whole chicken into a pot (that has a lid). All the extra marinade? Transfer that too. With the lid over your pot, I let the chicken cook on the lowest heat possible on my stove. Every hour, with the help of two flat spatulas, I turn the chicken over to help both of the sides cook evenly. Obviously, do this ever so gently [in the last hour or two especially] considering how tender the chicken will be. Tip: You don’t have to do this, but what I do is: about every 15-30 minutes or so (not on the dot, just whenever I come back into the kitchen or remember) I pour some of the extra marinade sauce that it’s in the pot all over the chicken. I love how it makes the chicken look at the end, and the extra flavor on the outside is great. This also helps keep the chicken moist, and not dry out either. If you don’t want to do this, or don’t have the time, at the end: just brush on (or pour) the extra marinade sauce in the pot over your chicken. 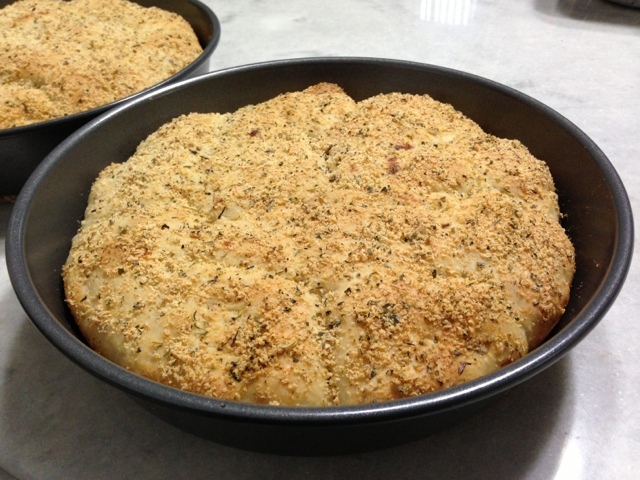 Ideas to serve alongside: any of these breads/rolls and/or these side dishes. Happy Birthday Faraz! We sure are getting to the age where I don’t even want to say the age anymore! For Faraz’s [my brother] birthday today, I narrowed down the dessert to something either to do with chocolate chip cookies or Oreos relatively quickly because those are his favorite [cookies]. Ultimately, Oreos won over simply because I came up with more ideas for it. 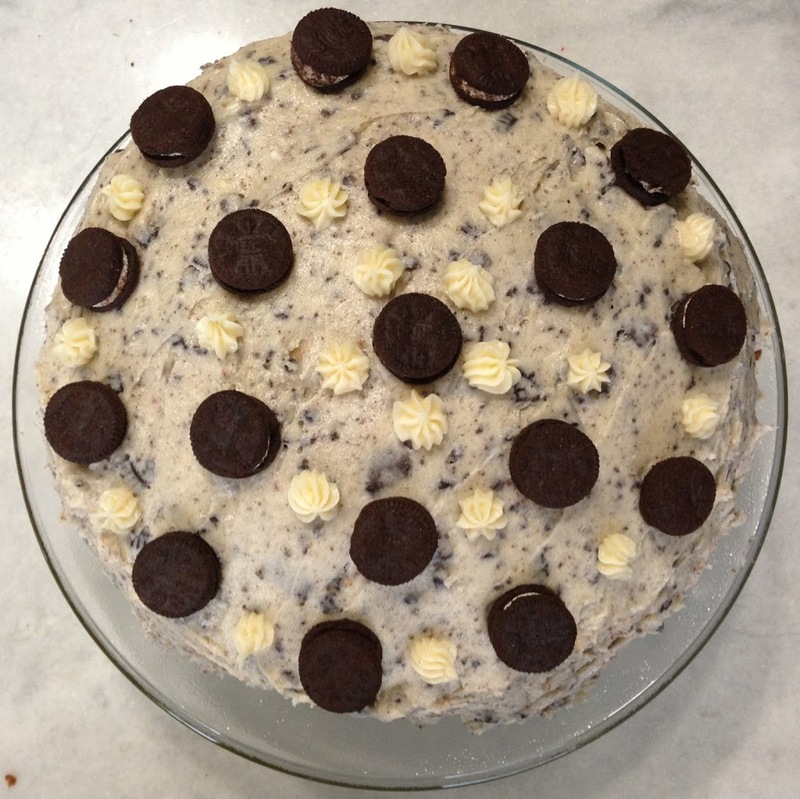 I made the following cake: Homemade Vanilla Cake with Oreo Buttercream frosting. I starting off by baking a white [yellow?] cake and butter-cream frosting. I changed up the frosting, however, by mixing in Oreo cookie crumbs [the white cream center portion and all]. Preheat your oven to 350 degrees. Spray your [non-stick] pans with non-stick cooking spray to be on the extra cautious side. Cream together your butter and sugar in a [large] mixing bowl until the mixture is light and fluffy [I’d say it takes about 3-4 minutes]. Next, add in your eggs and the vanilla extract. Beat your mixture until everything is combined. In a separate bowl: combine your flour, baking powder, and salt. Alternate adding in the milk and your dry ingredient combination to your wet mixture. So add in some of the flour mixture, and then some of the milk. Keep repeating until everything is incorporated in. Mix just until combined. Pour the batter evenly into (two) cake pan(s). Bake for about 30 minutes (for 2 nine-inch round cakes) [or until a toothpick, fork, etc. inserted into the center of the cake comes out clean]. Let the cake(s) cool for around 10 minutes before removing them from the pan to a wire rack [and letting them cool completely]. Cupcakes would probably bake for around 18-20 minutes [only fill 2/3 of the way up as they will rise!]. Put the softened butter in a bowl, and cream it on medium to high speed for several minutes. Reduce the speed of your mixer to low, and gradually add in the powdered sugar. Two cups of powdered sugar was plenty for me, but you may want to taste it and add some more if you want it sweeter. When all of your powdered sugar has been incorporated, increase the speed to medium before adding in the vanilla extract. Mix well until everything is incorporated. I needed 2 and a half times the amount listed above to frost in between and around a two layered cake, but it was much easier to do it in batches as I don’t have a stand-mixer… and was using my hand-mixer!. For frosting the cake for my brother, I wanted to incorporate in Oreos, so what I did was: I took a little frosting [ about 1 cup or so?] and set it aside for later use. Next, for each batch of frosting, I crumbled about half a cup of [normal sized] Oreo cookies, and folded it into the majority of the frosting [not the one I set aside for later use]. The frosting was absolutely delicious as is without the Oreos, but incorporating the Oreos into the frosting itself took the cake over the top. I wanted to incorporate the Oreos into the cake batter itself as well, but out of a abundance of caution I decided not to experiment with that. I did need a cake for the night, after all. Tip: You can store any unused frosting in the refrigerator in an airtight container. Just let it come to room temperature before using it again. Tip: Line the bottom of the platter [or whatever you plan to serve the cake in] with parchment paper along just the corners. This will help keep the platter edges neat and clean while you frost. The mess will remain on the parchment paper, which you can easily remove when you are done. Place one of your cake rounds on the platter and frost the top of the cake with your frosting. Do this liberally, as it will also serve as the binding layer between your two layers of cake! That frosting I set aside earlier? I used that to decorate on top of my Oreo-frosted cake along the top of my cake, leaving some space in between each. Finally, I added a bite-size Oreo in between each of the decorated star on top. When you are done decorating the cake, don’t forget to pull out the parchment paper along the bottom of the platter! Like I mentioned in this post: it is much easier to have smaller pieces of parchment paper, instead of one large one, when you are ready to remove the parchment paper at the end.